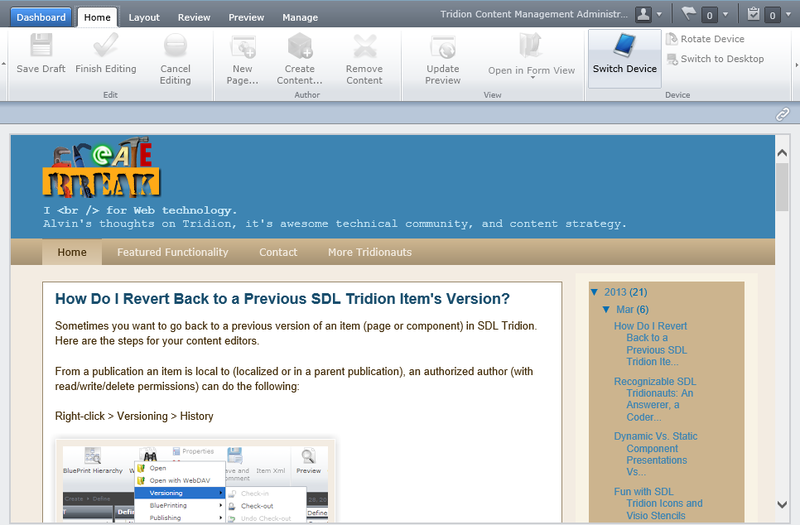 With the release of SDL Tridion 2013, I'll be managing CreateAndBreak with my test 2013 VM. Just a few content types at-a-time! Device Preview renders the site nicely as well. 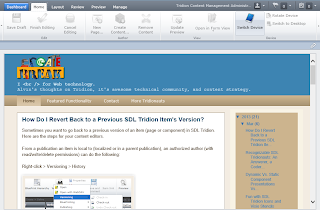 SDL Tridion 2013 introduces Bundles, which are virtual folders that allow authors the ability to manually group and add items to an organizational item (rather than by search). Learn more about these practices and see example code to replace your templating approaches with the Core Service. Of course I wouldn’t recommend such crazy best practices. Nor am I managing CreateAndBreak with Tridion (a single tech blog doesn’t quite fit the enterprise customer scenario, no matter how much I post). The Enter Web Address option and Device Preview are really a part of SDL Tridion 2013–and the screenshots come from my test VM’s browser. I used the Enter Web Address option, which lets you open Experience Manager-enabled pages without leaving Experience Manager. This is especially useful if you don’t have an easy-to-navigate URL. For fun put in any website and turn on the Device Preview feature. Bundles is a compelling new feature introduced in SDL Tridion 2013, but you’ll still want to use folders (you need at least one!). And yes, the Core Service is behind the Content Manager Explorer’s API calls in 2013 as well, but don’t confuse it with templating best practices. Keep CM and CD separate and don’t bypass publishing even if your use case is a single blog. Even Google’s Blogger has a publish button. See how I really feel about Tridion Best Practices.